There are 4 main steps that are key. Abide by these, and your on your way to becoming the 'husband' of a healthy flock. To make it easy, follow the plan below and don't be afraid to click on a link if you need more information. As more people turn to raising chickens in town to help make ends meet, garner eggs and meat, it's important to note that many areas have regulations regarding how many chickens you can raise. They also tend to regulate whether or not you can have a rooster (it seems to be greatly frowned upon to have a rooster residing in town). If your zoning area is urban you may be fine to have some chickens. However, if you're residing in a residential area you may have to have a permit or only be allowed to have a certain amount of chickens. If you're living in a rental you may also have to have permission from your landlord regarding whether or not you can raise chickens on the property. If you're unsure of how your specific neighborhood is classified you can check with your local city hall. They should have records on each and every home in the area and be able to tell you if your home is inside or outside of the city limits. To know whether you can legally keep chickens at your home residence, you need to explore the zoning laws for your location. Then, take a look at any special regulations in that zoning district that may affect either chicken-keeping or building chicken housing. Each area will be slightly different. Your property may be zoned as agricultural, residential, business, or any number of subcategories. Raising your chickens means that you're going to be caring for them from the fluff ball stage to the end. Here's how to start those little balls of puff off right. 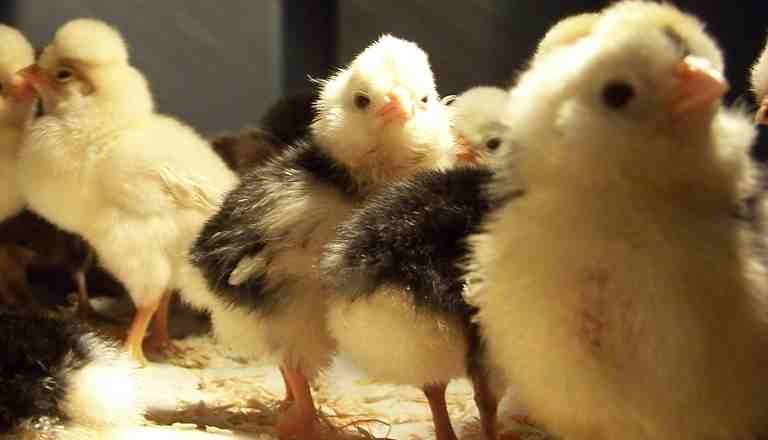 Brooder: Your little fluff balls are going to require a brooder. This brooder should be about 18 inches tall so that they can't sneak out and to prevent drafts. You'll need a source of heat, a heat lamp works very nicely for this. You'll also need to have at least 6 inches of space per chick. Keep your brooder away from predators by protecting it wherever you put it. You'll want to cover the floor of the brooder with pine shavings or some other kind of bedding. Avoid kitty litter and cedar shavings as these can emit too strong of a scent. Newsprint is too absorbing and will remain wet. You may wish to cover the litter with a towel or something to keep the chicks from eating the litter during the first few days. After that you can remove it, they will know where their food source is by then. Keep your brooder plenty warm. The first week of life it should be kept at 95 degrees Fahrenheit at all times. You can then reduce the temperature by 5 degrees until the temperature reaches the surrounding temperature or 60 degrees Fahrenheit. 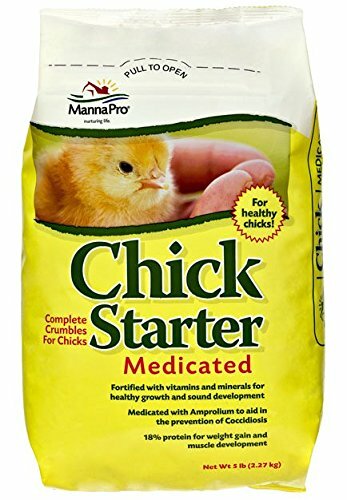 Always use chick starter feed unless you're raising chicks for meat in which case you should use a meat starter feed. You can use paper towels or white paper the first week or so to teach the chicks where to eat at. Water should be in a shallow pan or narrow container to prevent drowning. They need to be able to gently dip their beaks into the water and you may have to show them once or twice to ensure that they understand. Avoid handling baby chicks unless absolutely necessary. It stresses them and may wind up killing them. Troubleshooting is fairly easy. Happy chicks are quiet and content and unhappy chicks are noisy. If they are noisy you'll know that something is amiss. It could as simple as the temperature is too cool or there isn't enough space. When chicks are older you'll want to have the nesting boxes ready so you might want to look into those while they're young and in the brooder. Consider your cages or pens while the chicks are in the brooder as well. This is the time to begin designing and building it. 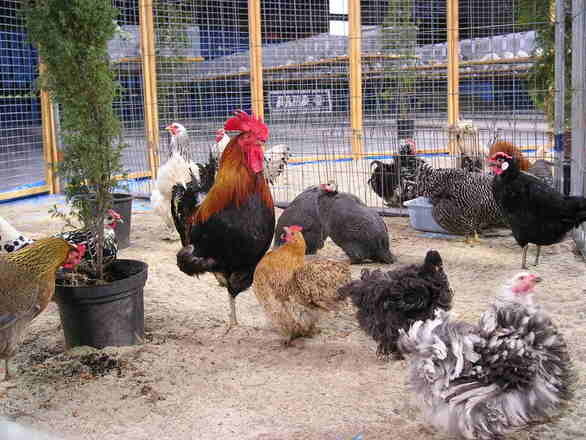 With so many breeds it may seem overwhelming to decide which chickens you wish to raise. It's vital to select the right breed for your purpose. If you're concentrating on egg layers, our chart below will help you to choose which breed will suit your needs. There are many to choose from. If you're looking for a specific egg color we've listed those as well. 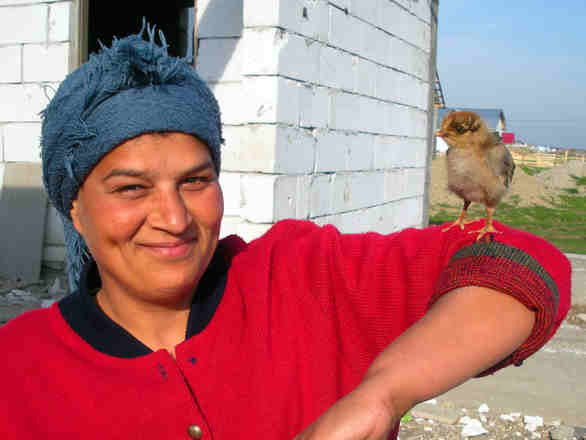 It can be fun and educational for everyone in the family to raise chickens. From selecting the chicks to gathering the eggs everyone in the family can be involved. The question that remains now is which breed of chickens to select. 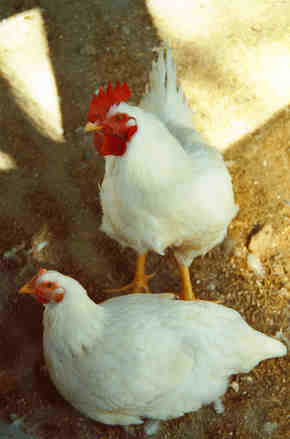 There are breeds for egg layers, meat or exhibition. We've listed out some of the more popular egg laying breeds. There are many things to consider before selecting a chicken breed for your flock. The kind of chicken you select depends on whether you want meat, eggs, or exhibition poultry. Hens from chicken breeds developed specifically for egg production lay year round and can produce more than 300 eggs in a year. Leghorns are the most common egg producer and can produce up to 260 eggs in a year. They are light in weight and easy to care for. 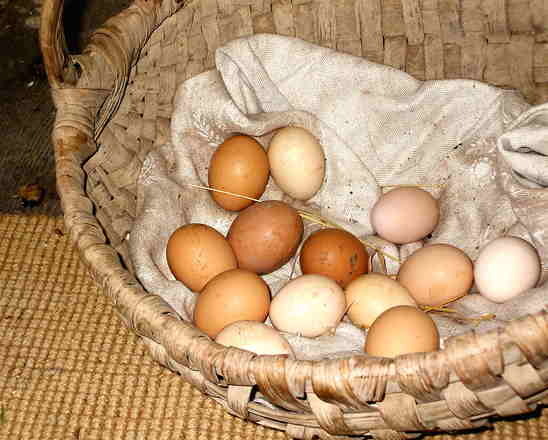 If brown eggs are what you're seeking, you may wish to consider a Plymouth Rock or a Rhode Island Red. These will both produce many eggs however, they also require more feed than do the Leghorns. There are many places that you can buy your chicks. Once you decide which breed you're seeking, you can then check with a hatchery approved by the National Poultry Improvement Plan, your local feed store or other feed companies. It is safe to send day old chicks via Priority Post. Caring for chickens requires daily chores. The chicks must be fed and watered on a daily basis for them to grow healthy and begin laying eggs. As your chicks grow you'll need to adjust the type of feed and the amount of feed that you're feeding them. You will need a heat source when they are young until they can maintain their own body temperatures. In order to have healthy egg producing chickens you'll need their feed to have plenty of protein and address their calcium needs. They can have scraps and odd grains however, these may lead to nutritional deficiencies if they aren't feed regular feed as well. Chickens must always be protected from extreme weather. This could be extreme hot or cold issues. They should have a well ventilated area so that they won't develop lung issues. Each chicken must have its own space. For full grown chicks this is at least 2 feet to 3 feet. For chicks it's just about six inches per chick. If they're too crowded it can lead to stress. What people can expect with maintenance including time/money investment. If you're investing in chickens, you can expect a good return dependent upon the breed you buy and how many. Certain breeds are better egg layers than others so you'll want to ensure that you're choosing a breed that will lay you plenty of eggs in lieu of one that will only lay about a dozen eggs per year. Life chickens are a huge responsibility but it can be very rewarding. It's fun for children to see the entire process of raising them from fluff balls to full grown egg laying chicks. They'll learn how to feed and care for the chicks and how to collect eggs. Eggs can be stored on the counter as long as the bloom hasn't been washed off, once the bloom is removed it's time to refrigerate the eggs. To preserve the bloom simply brush off any debris and avoid using any water or cloth on the eggs. Both will remove the bloom. Eggs should be rinsed off before breaking them open to cook. This will remove any debris or bacteria that may have gotten onto the egg. Chickens are a great to have and provide many benefits. We believe that more homes should have chickens in their backyards! If you feel the same way, or you just want more information on chicken husbandry feel free to look around the site. You can also sign up to the newsletter to be the first to know about new articles, and get new tips about chickens.